Underground Exterminator for control of rodents, moles and other pests. FINALLY... A SOLUTION THAT WORKS!! The hairy-tailed mole mates in the spring just before most of the insects come out of their winter dormant stage. The male finds the female in her burrow and mates. There seems to be no ritual about this. Four to six weeks later, the young are born. They drop onto the dried grass or leaves covering the mother's nest. This nest is really just a hole in the ground covered with dry leaves and grass. The young then take milk greedily from the mother's teats. In a few weeks, they have fur and can eat adult foods. A month after birth, the young can take care of themselves and are on their own. The hairy-tailed mole has different feeding habits than most moles. It feeds underground during daylight and winter, but comes out of its burrows often during the dark hours of the warmer months. It is so busy looking for food that it can be caught by hand. It is sometimes captured by pet cats and wild meat-eaters, but this is rare. The hairy-tailed mole is active during the winter but hunts in deeper burrows below the frost line. It may live in the forest for four to five years. When it dies, its many tunnels are taken over by the later generations of hairy-tailed moles. Most forests where these moles live have whole networks of tunnels built by many generations of moles. The ridges are not noticeable under the leafy cover of the forest floor. and death occurs within 5 to 7 minutes without pain or discomfort." Why is this the Fastest and Most Effective Solution? Extremely effective because it Goes To the rodent by using Pressurized engine exhaust to fill burrow with odorless carbon monoxide. These shrewd rodents may not go into traps or eat poison but they Must Breathe. It eliminates More than one at a time. ONE solution for ALL underground rodents. 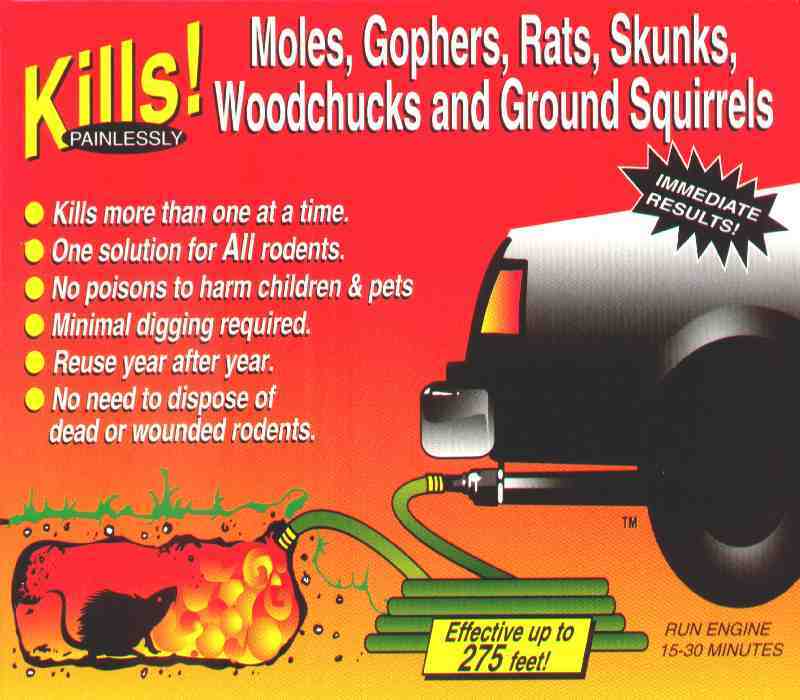 No need to dispose of dead or wounded rodents. Your cost is $10 to $14 at your local hardware store and it can be used year after year. A small price to solve a long term and damaging problem. Continue thru the page to learn more and hear Testimonials from hardware store owners who deal directly with customers, like yourself, and have heard first hand what works and what doesn't. Also, I'm available to you via email at manningprd@aol.com (Free Advice) to answer any questions you may have concerning your rodent problem and I will make every effort to help you resolve it. You now have help in the rodent wars from someone who has been there. Easily connects to your exhaust pipe and protects your garden hose. It provides maximum pressure thru the hose needed to fill the burrow. TO FIND OUT WHAT THIS PRODUCT CAN DO FOR YOU!